Amy Land was the recipient of the Silver Beaver Award at the annual Tecumseh Council recognition dinner on Saturday. It is the highest National Scouting Award a local Boy Scout Council may bestow upon an individual in Scouting. Amy was honored for her leadership in serving various positions for over 12 years. In the R.E. Hadley District (Clinton County), Amy has served as the District Commissioner and on the District Committee. Currently she is the district Cub Scout Roundtable Commissioner and the Popcorn Kernel coordinator for the council. 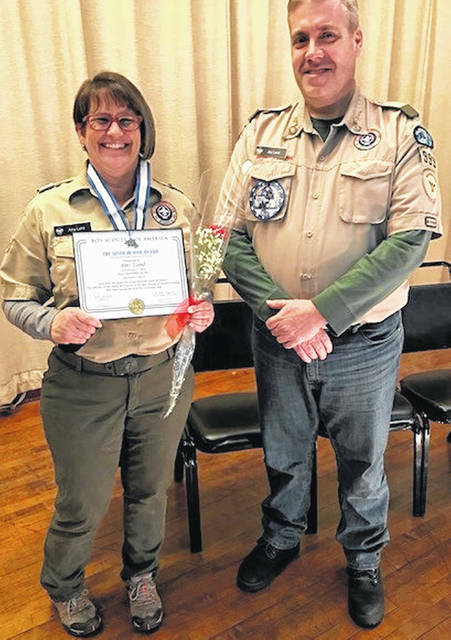 In 2015 Amy received the District Award of Merit for her work as a key team player on the district committee recruiting adults for various committee positions. She and her husband, Jay, who is the Scoutmaster, chartered Troop 999 in 2011. It meets at the Chester Township Fire Department. A few years later they chartered Venture Crew 999. Amy serves as the troop Assistant Scoutmaster and crew advisor. The Lands have two children — Alex is an Eagle Scout and Abby is attending graduate school at the University of Dayton.